Copyright © 2018 IMS Global Learning Consortium. All Rights Reserved. Use of this specification to develop products or services is governed by the license with IMS found on the IMS website: http://www.imsglobal.org/speclicense.html. Public contributions, comments and questions can be posted here: http://www.imsglobal.org/forums/ims-glc-public-forums-and-resources/learning-information-services-oneroster-public-forum. © 2018 IMS Global Learning Consortium, Inc. The IMS Logo and OneRoster are trademarks of the IMS Global Learning Consortium, Inc. in the United States and/or other countries. Learning Information Services (LIS) is a standard that is maintained by IMS Global [LIS, 13]. The standard addresses the exchange of student data (about people, courses, enrollments and grades) between different educational systems. LIS has very wide adoption in Higher Education (HE). OneRoster is a reworking of that specification to support the specific needs of K-12. 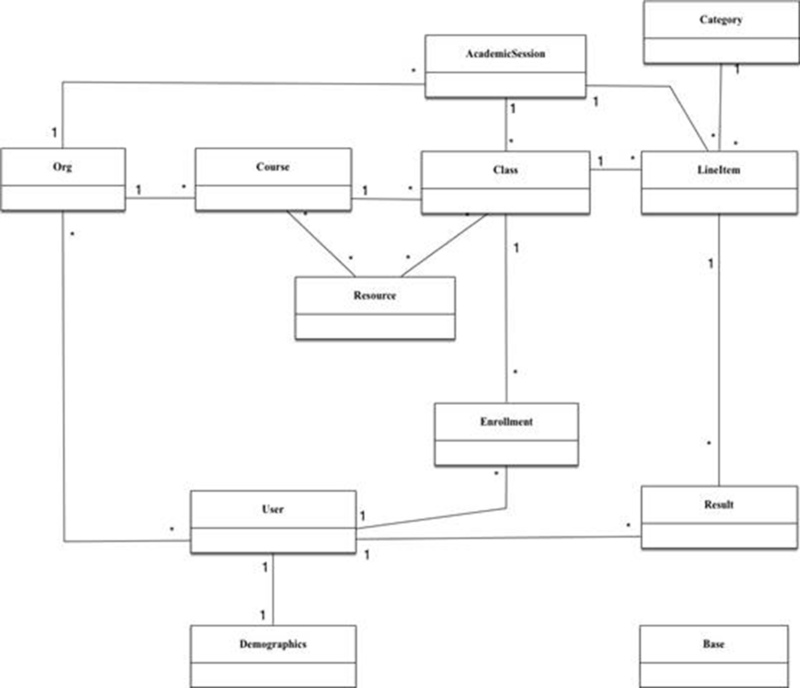 OneRoster is a considerably simplified LIS service and data model. The binding for OneRoster is either a pure data format using Comma Separated Value (CSV) files or as a service with data exchange between service providers and service consumers using a RESTful approach carrying Java Script Object Notation (JSON)-encoded data. IMS Members representing the interests of the K12 sector completed an evaluation of LIS. They found LIS to broadly meet their needs when it came to student enrollment scenarios, but desired extra functionality when it came to the transport of grades and grade-books. The group wanted to use functionality of LIS, but to make it simpler to use. In LIS, there are eleven documents that describe the six LIS services and the information models that underpins them. More documents describe the XML schemas, WSDL files, conformance tests and more. Most of these documents are generated from the computer UML models of LIS, and then augmented with highly technical commentary. The LIS working group created the LIS that limited implementers to building a subset of the services and operations. The core profile means that developers need only consider the replace and delete operations for the person, group, membership and course section services. Conformance to the core profile can be tested, and all of the LIS conformant products to date are to the core profile. The LIS group also created the FINAL GRADE profile of LIS, and this is a statement of the operations that developers need to build in order to move final grades for course sections between systems. Conformance to this profile can be tested. • The security model has been extended to allow optional exchange using to OAuth 2 Bearer Tokens with HMAC-SHA2 and Transport Layer Security (TLS). Support for TLS 1.2 or TLS 1.3 is REQUIRED and use of SSL is now PROHIBITED. b) The 'Best Practices' section has been moved to the 'OneRoster 1.1 Best Practices and Implementation Guide' [OneRoster, 17b]. • Gradebook - to enable management of the lineItems, results and categories. NOTE: New features are denoted by yellow shading and features that have been modified are denoted by blue shading. A visualization of the full data model. [ISO 8601] ISO8601:2004 Data elements and interchange formats - Information interchange - Representation of dates and times, ISO, International Standards Organization (ISO), 2000, p.33. [LIS, 13] IMS Learning Information Services, C.Smythe IMS Global, July 2013. [LTI, 10] IMS Learning Tools Interoperability (LTI) v1.0, S.Vickers, IMS Global, May 2010. [OneRoster, 15a] OneRoster Specification v1.0, P.Nicholls, IMS Global, July 2015. [OneRoster, 15b] OneRoster Specification: CSV Tables v1.0, P.Nicholls, IMS Global, July 2015. [OneRoster, 17a] OneRoster Specification: CSV Tables v1.1 Final Release, P.Nicholls and C.Smythe, IMS Global, April 2017. [OneRoster, 17b] OneRoster v1.1 Best Practices and Implementation Guide, C.Smythe and P.Nicholls, Version 1.1 Final Release, IMS Global, April 2017. [OneRoster, 17c] OneRoster v1.1 Conformance and Certification, L.Mattson and C.Smythe, Version 1.1 Final Release, IMS Global, April 2017. [RFC5849] OAuth Version 1.0 IETF, April 2010. [UNICODE, 16] UNICODE Collation Algorithm Version 9.0, M.Davis, K.Whistler and M.Scheer, Unicode® Technical Standard #10, May 2016. The following are the requirements for the LIS profile for K12. This table of requirements has been updated since the previous version of this document. New requirements from the previous version are shown under the "NEW REQUIREMENTS" line (shaded in 'yellow'). Support for a term object, with fields: ID, Title, Start Date, End Date. Support for a username field in Person. Support for a "Category" in relation to a line item. Support for a Grade Comment in Result. Support for an "Assignment" in relation to a Line Item. Assignment Fields: ID, Title, Description, Due Date, Category [see 3], Grading Scale [result value]. RESTful Binding (HTTP Verbs, 'normal' RESTful URL patterns. Solution also possible in SOAP / WSDL. Decide if there are multiple data types per file / message, or just one data type per file/message. Simple Data Types: Course, Class, Teacher, Student, Term. Simple Data Type: Student = Student ID and Student Name. Simple Data Type: Course = Course ID and Course Name. Simple Data Type: Class = Class ID and Class Name. Simple Data Type: Teacher = Teacher ID and Teacher Name. A school has multiple courses; a course has multiple classes; users take multiple classes and classes are made up of multiple users. Teachers teach in many Schools, Learners Learn in many Schools, a school has many teachers and a school has many learners. There must be a notion of data and transactions security (authorization and encryption), which uses two-legged OAuth 1.0a, as LTI does. Define a structure for multiple levels or organization (school, district, state, country). Add a notion of "grade" - e.g. Elementary, Middle, High. Add a notion of a Grading Period, which is a unit of time, in which a lineItem has been assessed. Modify the vocabulary for Result Status: Not Submitted, Submitted, Partially Graded, Fully Graded, Exempt. Remove Result Value from Result (Grade). User Field: Student ID#, Teacher ID# - a human readable identifier for users. User Field: Parent Information, User Type. Add API entry point to get all classes for student. All classes: Add a version id, or a date, so that requesters can access just the records that have changed, Add a status ("active or tobedeleted"). Add support for an extensions mechanism, allowing new fields to be passed in the JSON. Add endpoints: classes for teacher, students for class in school, teachers for class in school. Make explicit the relationships between objects. Add term information to class. Add a mechanism for adding metadata to classes. LTI User ID field to be renamed (07.04.2015). Break out enrollments into own object. Add support for the 'getClassesForUser' operation. Extend the Course data model with support for assigning 'resources' to courses. Add support for 'getResourcesForCourse' operation. Extend the Class data model with support for assigning 'resources' to classes. Add support for 'get' a description of a resource. Add support for 'getResourcesForClass' operation. Add the 'grade' data field to the User class in the data model. Add the 'beginDate' and 'endDate' data fields to the Enrolment class in the data model. Restructure the 'userId' field in the User class to support the type if identifier. Add the 'password' data field to the User class in the data model. Add the 'middleName' data field to the User class in the data model. 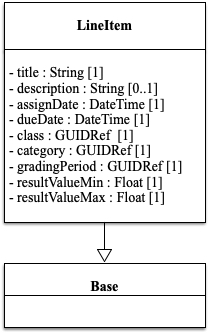 Add the 'periods' data field to the Class class in the data model. Add the 'schoolYear' field to the AcademicSession data model. 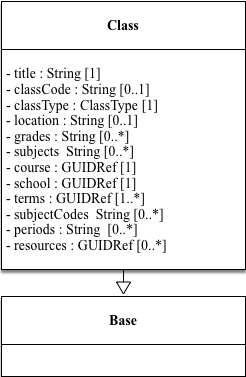 Add the 'subjectCodes' data field to the Class and Course classes in the data model. Add to the security model support for the use OAuth 2 Bearer Tokens with SHA-2 and TLS. Add optional usage of SHA-2 with the OAuth 1.0a for request signing. Add support for 'get', 'delete' and 'put' operations for LineItem objects. Add support for 'get', 'delete' and 'put' operations for Result objects. Add support for 'delete' and 'put' operations for Category objects. Table 2.1 - Requirements for LIS in K12. This section describes the RESTful binding of the data model. This RESTful binding addresses requirements [R8, R11, R19, R34, R37, R44, R45, R46, R48, 50, 51, 62 and R63]. Tables 3.1a, 3.1b and 3.1c show the permitted HTTP verbs for each endpoint/resource type. See the OneRoster Conformance and Certification document [OneRoster, 17c] for details on the endpoints that MUST be supported. Table 3.1a - HTTP Endpoints for Rostering. Return collection of all academic sessions. Return collection of grading periods. A Grading Period is an instance of an AcademicSession. Return specific Grading Period. A Grading Period is an instance of an AcademicSession. Return collection of all enrollments. Return collection of schools. A School is an instance of an Org. Return specific school. A School is an instance of an Org. Return collection of students. A Student is an instance of a User. Return specific student. A Student is an instance of a User. Return collection of teachers. A Teacher is an instance of a User. Return collection of terms. A Term is an instance of an AcademicSession. Return the collection of courses taught by this school. Return the collection of all enrollments into this class. Return the collection of students taking this class in this school. Return the collection of teachers taking this class in this school. Return the collection of all enrollments for this school. Return the collection of students attending this school. Return the collection of teachers teaching at this school. Return the collection of terms that are used by this school. Return the collection of classes that are taught in this term. Return the collection of Grading Periods that are part of this term. Return the collection of classes that are teaching this course. Return the collection of classes that this student is taking. Return the collection of classes that this teacher is teaching. Return the collection of classes taught by this school. Return the collection of classes attended by this user. Return the collection of students that are taking this class. Return the collection of teachers that are teaching this class. Table 3.1b - HTTP Endpoints for Resources. Return the collection of resources associated to this course. Return the collection of resources associated to this class. Table 3.1c - HTTP Endpoints for Gradebooks. Return collection of grading categories. Enable the associated SourcedId to be marked as deleted. An immediate read will result in 404 code. To create a new Category record or to replace one that already exists. To create a new LineItem record or to replace one that already exists. To create a new Result record or to replace one that already exists. Return the collection of results (assessed grades) for this class. Return the collection of line items (Columns) in the gradebook for this class. Return the collection of results (assessed grades), for this specific lineItem (Column) for this class. Return the collection of results (assessed grades), for this specific student, attending this class. In the case of a 'DELETE' it is not a requirement that the record is hard deleted. From the perspective of this interoperability specification the key requirement is that once a delete has been issued, any immediate 'GET' request will result in a 404 status code being returned. The state diagram for the 'Pull Model" based data exchange is shown in Figure 3.1. In this model the service consumer must read the data from the service provider. Figure 3.1 - The state diagram for 'pull' driven data exchange. 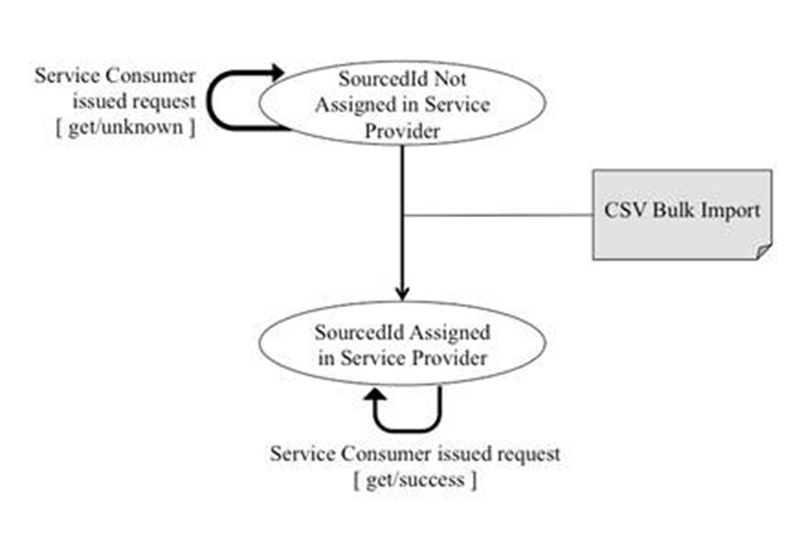 The state diagram shows that if a read request (from the service consumer) is issued on a 'sourcedId' before it has been assigned in the service provider then a failure/unknown error will occur. Once the 'sourcedId' has been assigned (for example using the OneRoster CSV Bulk Import) then a read request should be successful and the request object returned in the service payload. For OR 1.1 the push capability is ONLY available for the Rostering, Resources and Gradebook services. The state diagram for the 'Push Model" based data exchange is shown in Figure 3.2. In this model the service provider must write the data into the service consumer. 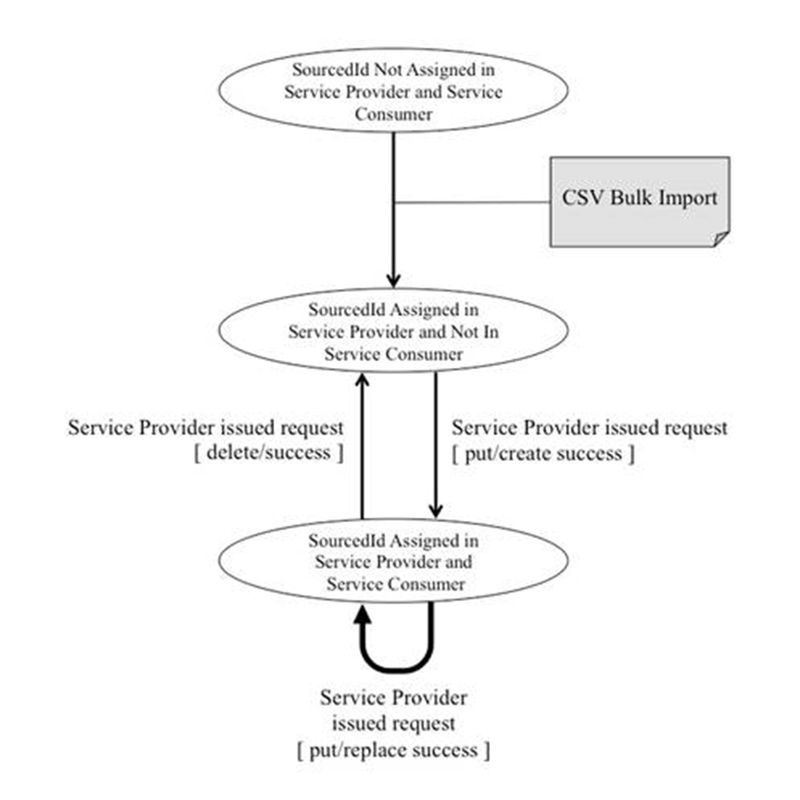 The state diagram shows that the push process can only begin once a 'sourcedId' has been assigned within the service provider (for example using the OneRoster CSV Bulk Import). The service provider can now create a new record in a service consumer by issuing the write request (HTTP Put request). If this is the first time this 'sourcedId' has been allocated in the service consumer a 'create success' response will be returned. If this is a repeated write request then the response will be a 'replace success'. The service provider can 'delete' the record. For OR 1.1 the push capability is ONLY available for the Gradebook service. Figure 3.2 - The state diagram for 'push' driven data exchange. The API Root URL MUST be /ims/oneroster. To allow further versions of the specification to exist in a controlled manner, the new version number MUST be '/v1p1'. • A link to the developer documentation (for example, the online version of the specification, a link to online API documentation). 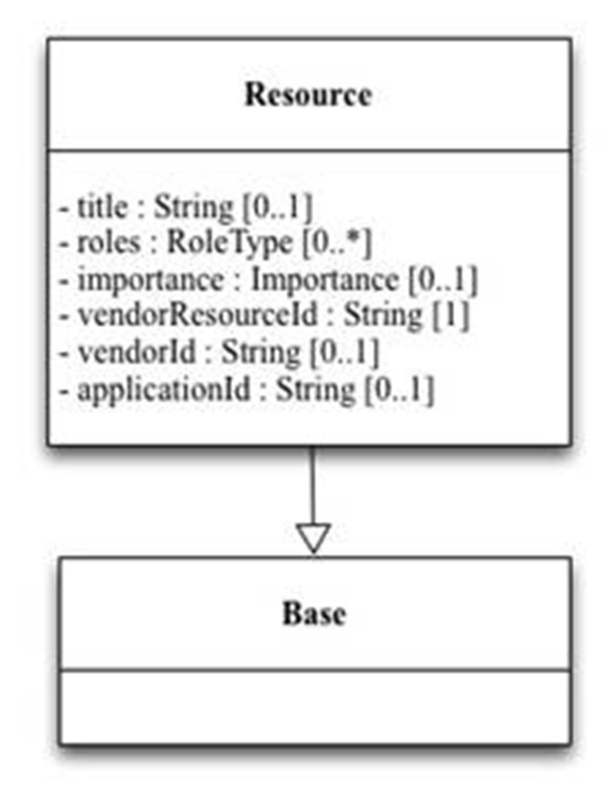 JSON IS the binding form to represent the resource data. Section 4 shows the data models that are required to be bound. 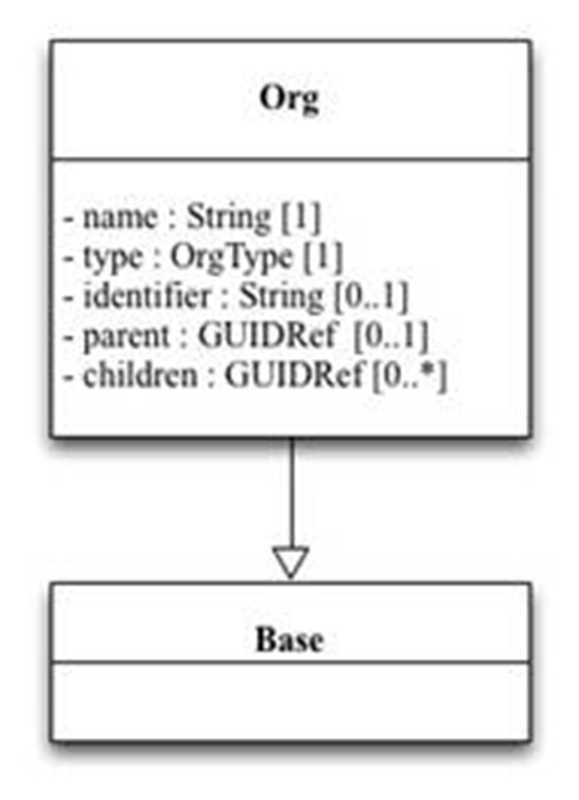 Parsers MUST be capable of parsing the JSON data (see Section 5) shown in the UML and example bindings. Parsers MAY ignore any other JSON fields that they encounter, UNLESS those fields are in the extension space (see later). It is expected that Student Information Systems may well contain massive amounts of data, and as such there is a real danger of data overload if entire collections are requested. To avoid this, implementations MUST adopt a pagination mechanism. Pagination is controlled via two parameters that are appended to the request. The default value for limit MUST be 100. The default value for offset MUST be 0. It is RECOMMENDED that implementations pass the total resource count in collection back to the requester. This MUST be provided in the custom HTTP header: X-Total-Count. It is RECOMMENDED that implementers pass back next, previous, first and last links in the HTTP Link Header. Example: 503 student resources exist in the collection. Pagination is on the second page, in units of 10. NOTE: Pagination must be supported for ALL endpoints that return a collection. • orderBy MAY be used in the request to ask for the collection to be ordered ascending (asc) or descending (desc). Sorting should conform to the use of the Unicode Collation Algorithm [UNICODE, 16] when using the relevant comparisons. • Description should contain the supplied unknown field. NOTE: Sorting must be supported for ALL endpoints that return a collection. It MUST be possible to filter collections for elements matching a certain criteria. It MUST be possible to filter collections based on any data element in the core description of the resource. The data fields that can be used are those present in the class definition being filtered. So for example in "courses", it MUST be possible to filter on: 'sourcedId', 'status', 'dateLastModified', 'title', 'grades', 'subjects', etc. Table 3.2 - List of predicates used for filtering. Values MUST be enclosed within single quotes and they must be handled as case insensitive. When the response is returned it is the receiving system that should consider whether or not case-sensitivity is important. <logical> parameters allow more complex queries to be created. For version 1.1, it is RECOMMENDED that logical operations are limited to " AND " and " OR " (note the surrounding white space at each side) and that there is only one such operator used in any filter i.e. a single 'AND' or a single 'OR' in the filter. A single white space must occur before and after the parameter. Note then when querying on metadata, the property is loosely typed. Filter queries MUST be URL encoded. • ?filter="subject~subject1,subject2,subject3" - record returned. This means filtering using the '=' has 'AND' semantics and for '~" has 'OR' semantics. Filtering rules should conform to the use of the Unicode Collation Algorithm [UNICODE, 16] when using the relevant comparisons. NOTE: Filtering must be supported for ALL endpoints that return a collection. It MUST be possible for requesters to select the range of fields to be returned. By default, all mandatory and optional fields from the core description of the resource MUST be returned. If any fields are specified in the request then the implementation MUST return those fields AND ONLY those fields i.e. the multiplicity rules for an element are overridden. Any Field or fields from the Full Data Model MAY be requested. Any field or fields from the Data Model MAY be requested. Field selection request MUST make use of the reserved word fields. The value of fields is a comma delimited list of the fields to return. • StatusCode value is the corresponding HTTP response code. NOTE: Field Selection must be supported for ALL read endpoints. Implementations MUST be able to report the existence of errors that arise when processing the request. Error reporting MUST make use of the following HTTP response codes listed in Table 3.3. Table 3.3 - HTTP response codes. OK - It was possible to read the collection / resource. OK - New resource has been created. OK - The resource was deleted successfully. Bad Request - the Request was invalid and cannot be served. Unauthorized - the Request requires authorization. Forbidden - to indicate that the server can be reached and process the request but refuses to take any further action. Not Found - there is no resource behind the URI. Entity cannot be processed - used where the server cannot validate an incoming entity. The server is receiving too many requests. Retry at a later time. Avoid - use only if there is catastrophic error and there is not a more appropriate code. The error payload follows the prevailing LIS practice of specifying a CodeMajor, Severity, CodeMinor and description. • Description: A text string providing a human readable description of the error that happened. Table 3.4 shows how these errors can be applied to the HTTP response codes. Table 3.4 - Error Payloads from LIS. It is RECOMMENDED that for successful requests, no error payload is returned; the HTTP status code should be enough. • The use of OAuth 2 Bearer Tokens as defined in RFC 6750 for authorization with Transaction Layer Security (TLS) for message encryption. As the service will be exposing personal data related to students and their grades, it is important that only authorized users have access to that data. Further, data exchanges should be encrypted to ensure that packet sniffing cannot be used to read the data in transit. • All Requests and Responses MUST be sent using Transaction Layer Security (TLS). Exchange of the signed certificates for endpoints between clients and servers is beyond the scope of this specification. Implementers of clients and servers are advised to look at the various 3rd party certificate signing services in order to obtain signed certificates. Support for TLS 1.2 is REQUIRED and use of SSL is now PROHIBITED. In the interest of simplicity, and to get implementations up and running as fast as possible, versions 1.0 and 1.1 of this specification use the same OAuth [RFC 5849] signing approach as does IMS Learning Tools Interoperability® (LTI®) [LTI, 10]. • Append the OAuth parameters from Table 3.5 to the request Authorization HTTP header field. • Append the OAuth signature, which is a hash of the entire request string, and the OAuth parameters (except signature), encrypted via the oauth_consumer_secret, to the Authorization HTTP header field. Table 3.5 - OAuth parameters. The public consumer key for the requester. The timestamp of the message, unix long milliseconds from 1st Jan 1970. Number to use once - used to avoid replay attacks, and should be unique per request. Servers should store the nonces for 90 minutes to ensure that they are not reused. The version of OAuth to use. The signature of the request itself (without the extra OAuth parameters) encrypted using the oauth_consumer_secret. This is computed using a SHA-256 hash of the body content. It is required for all HTTP PUT requests and must not be present for HTTP GET requests. Not Used - but may be required by implementing library. As of 1st July 2018, Servers MUST support the HMAC-SHA256 signing method with OAuth data passed as GET data for conformance (support for HMAC-SHA1 is RECOMMENDED for backwards compatibility until 31st December, 2019). IMS has formally deprecated the use of SHA1 hence the change to requiring the use of SHA256. NOTE that this security profile requires the client and server to have synchronized clocks. The use of a configurable time interval can adjust for slightly-off clocks, but setting the interval too large is discouraged. • If the calculated hash does not match the signature, the request is unauthorized. Clients MUST NOT send the OAuth consumer secret in the request. • The parameters of the request (including the OAuth parameters - note that for a 'PUT' request there is an extra OAuth parameter to be used). Append the encoded key to the output sting. Append the '=' character to the output string. 5. Percent encode the parameter String and append it to the output String. This final signature base string is then encrypted using the consumer secret. For more information see the OAuth documentation. OneRoster 1.1 permits the optional use of OAuth 2.0 Bearer Tokens with the Bearer Token obtained using the mechanism described in [RFC 6749] (https://tools.ietf.org/html/rfc6749#section-4.4). The use of OAuth 2.0 for IMS web services is defned in the document IMS Security Framework 1.0 (https://www.imsglobal.org/spec/security/v1p0/). Authorization will use the OAuth 2.0 'Client Credentials Grant' mechanism. In this mechanism the client can request an access token using only its client credentials (using the consumer key and secret information currently required in OneRoster's OAuth 1.0a usage) when the client is requesting access to the protected resources under its control, or those of another resource owner that have been previously arranged with the authorization server. In this approach the client issues a client authentication request and receives in response an access token. Issuing of an access token is defined in Section 5 of [RFC 6749]. The authorization encoding is produced using the consumer key and secret. NOTE: This exchange assumes that TLS is used to secure the link. For version 1.0/1.1, JSON data MUST be supported as the binding (this is the only binding for which there is conformance certification). Clients MAY ask for other bindings, but implementers are not obliged to provide them, and a 4XX response is valid. It is RECOMMENDED therefore to use the HTTP header field; Accept, with a value of "application/json". Implementers MUST use the HTTP header field: Content-Type, with a value of "application/json", to inform requesters that results will be returned in JSON. It is recognized that implementers may wish to extend the specification. The preferred mechanism for doing this is for implementers to use an extension space within the OneRoster data model, and then set their parsers to read those extension attributes (see Subsection 4.1 for the definition of this Metadata extension structure). The logical data model is shown in Figure 4.1, with the following scenario: A school teaches over a number of terms. A school teaches a number of courses, employs a number of teachers, and educates a number of students. A class is an instance of a course that is taught in a particular term. A course can consist of a number of classes. A class is assessed via a number of line items (columns in a gradebook), and a line item can be categorized. Students taking a class are assessed by grading; a lineItem will have zero or more results, but usually only one result per student. A more detailed representation is given in Appendix B. Classes and courses can identify the set of resources that are required in the delivery of the learning experience. Figure 4.1 - Logical Data Model. b) The support of ALL string-based data-types requires that a maximum length of at least 255 must be supported by implementations. If string lengths of greater than 255 are used then systems may truncate the string without failing conformance. Figure 4.2 - Base Class with Status Enumeration. • Metadata - all objects CAN be extended using the Metadata class. This specification is silent on what implementers may consider to be appropriate extensions. See subsection 4.13.8 for the enumeration list. For example: "boarding" : "false"
The Z denotes the UTC timezone. All data model extensions must be contained within the Metadata class. These extensions take the form of name/value pairs. The name is the label of the extension field, and the value is the value of the extension. For example, if wanting to show the extension of field "classification", with value "private" that was added/provided by "ims", the name/value pair is: "ims.classification":"private" (see subsection 5.13 for an example in JSON). AcademicSession represent durations of time. Typically they are used to describe terms, grading periods, and other durations e.g. school years. Term is used to describe a period of time during which learning will take place. Other words for term could be in common use around the world e.g. Semester. The important thing is that Term is a unit of time, often many weeks long, into which classes are scheduled. Grading Period is used to represent another unit of time, that within which line items are assessed. A term may have many grading periods, a grading period belongs to a single term. A class may be assessed over several grade periods (represented by a line item being connected to a grading period). The parent / child attributes of academic sessions allow terms to be connected to their grading periods and vice-versa. Table 4.2 - Data Elements for Academic Session. See subsection 4.13.7 for the enumeration list. Link to parent AcademicSession i.e. an AcademicSession 'sourcedId'. Links to children AcademicSession i.e. an AcademicSession 'sourcedId'. The school year for the academic session. This year should include the school year end e.g. 2014. A class is an instance of a course, onto which students and teachers are enrolled. A class is typically held within a term. See subsection 4.13.1 for the enumeration list. Grade(s) for which the class is attended. The permitted vocabulary is from CEDS (Version 5): https://ceds.ed.gov/ and the 'Entry Grade Level' element https://ceds.ed.gov/CEDSElementDetails.aspx?TermId=7100. Example: 09 or an array of 09,10 and 11. Link to course i.e. the Course 'sourcedId'. Link to school i.e. the School 'sourcedId'. Links to terms or semesters (academicSession) i.e. the set of 'sourcedIds' for the terms within the associated school year. This is a machine readable set of codes and the number should match the associated 'subjects' attribute. The vocabulary is from SCED (School Codes for the Exchange of Data Version 4): http://nces.ed.gov/forum/SCED.asp. The time slots in the day that the class will be given. Examples: 1 or an array of 1, 3, 5, etc. Link to resources i.e. the Resource 'sourcedId'. A Course is a course of study that, typically, has a shared curriculum although it may be taught to different students by different teachers. It is likely that several classes of a single course may be taught in a term. For example, a school runs Grade 9 English in the spring term. There are four classes, each with a different 30 students, taught by 4 different teachers. However the curriculum for each of those four classes is the same - the course curriculum. Figure 4.5 - Course Data Model. Link to academicSessioni.e. the AcademicSession 'sourcedId'. This is a human readable string. Example: "chemistry". Link to org i.e. the 'sourcedId' of the org. Link to resources if applicable i.e. the 'sourcedIds'. Demographics information is taken from the Common Educational Data Standards from the US government. (http://ceds.ed.gov). Demographics are OPTIONAL. Note that demographics data is held in its own service, and that access to this service is considered privileged. Not all consumer keys will be able to request demographics data. Demographic Data is modeled in LIS, but the sort of demographic data required by K12 is very different to that modeled in LIS. For this reason, new structures have been created. The 'sourcedId' of the demographics MUST be the same as the 'sourcedId' of the user to which it refers. See subsection 4.13.2 for the enumeration list. An enrollment is the name given to an individual taking part in a course or class. In the vast majority of cases, users will be students learning in a class, or teachers teaching the class. Other roles are also possible. Table 4.6 - Data Elements for Enrollments. See subsection 4.13.5 for the enumeration list. Applicable only to teachers. Only one teacher should be designated as the primary teacher for a class in the period defined by the begin/end dates. The start date for the enrollment (inclusive). This date must be within the period of the associated Academic Session for the class (Term/Semester/SchoolYear). The end date for the enrollment (exclusive). This date must be within the period of the associated Academic Session for the class (Term/Semester/SchoolYear). Line Items are assignments in LIS, they make up the column headings in a gradebook, and many students will each complete lineItems as they are assessed. It is proposed that the Line Item object take a subset of the elements used in LIS, and adds a few more which are relevant to K12. Table 4.7 - Data Elements for LineItems. Link to class i.e. the class 'sourcedId'. Link to item category i.e. the Line Item Category 'sourcedId'. A floating point number defining (inclusive) the minimum value for the result. A floating point number defining (inclusive) the maximum value for the result. 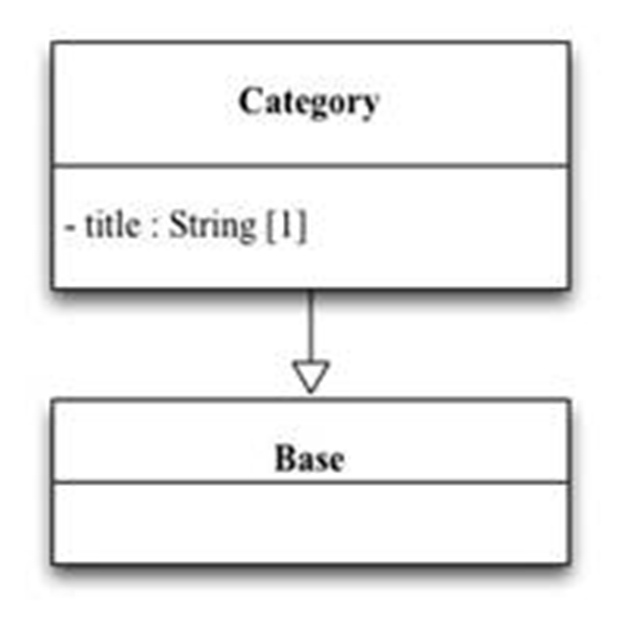 A Category is the name given to a grouping of line items. (Line Items being equivalent to assignments which students will complete). Examples of categories include "homework", "quizzes" or "essays". It is proposed that the Category object be defined as shown in Figure 4.9/Table 4.8. ORG is defined here as a structure for holding organizational information. An ORG might be a school, or it might be a local, statewide, or national entity. ORGs will typically have a parent ORG (up to the national level), and children, allowing a hierarchy to be established. School is defined here as the place where the learning happens. Most commonly this is the data that describes a bricks and mortar building, or, in the case of a virtual school, the virtual school organization. For enrollment and result reporting purposes, little information about this organization is required. Later versions of the specification could add further information, such as an address, for example. A common example of a local organization is a school district. Note that although School is a type of org, the default entry point for requests in most places will be a school. The API provides many school based entry points, whilst still allowing for more generic reading of ORGs, for those applications that need to. Figure 4.10 - Org Data Model. Table 4.9 - Data Elements for Organizations. See Subsection 4.13.4 for enumeration list. Human readable identifier for this org (e.g. NCES ID). Link to Org i.e. the child Org 'sourcedId'. A resource is a description of learning content that is related to a course and/or a class. This identifies a resource that is used by a teacher, learner, etc. as part of the learning experience. A resource MUST be associated to a course and/or a class. The set of roles. See subsection 4.13.5 for the enumeration list. See subsection 4.13.3 for the enumeration list. Unique identifier for the resource allocated by the vendor. Identifier for the vendor who created the resource. This will be assigned by IMS as part of Conformance Certification. Identifier for the application associated with the resource. It is proposed that the OneRoster Result object takes a subset of the equivalent LIS elements as shown in Figure 4.12/Table 4.11. 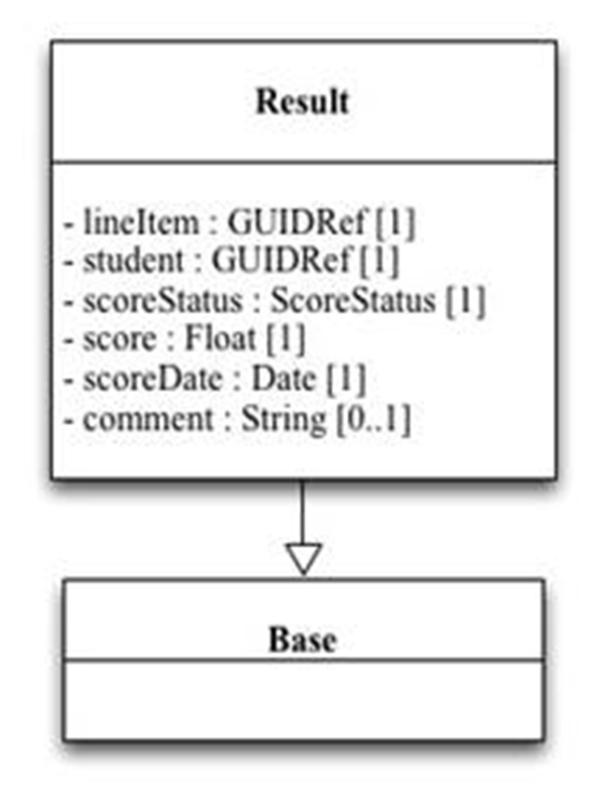 Figure 4.12 - Result Data Model. Link to lineItem i.e. the lineItem's 'sourcedId'. Link to student i.e. the user's 'sourcedId'. See subsection 4.13.6 for the enumeration list. Users, Teachers and Students are human beings that are teaching or studying in a class respectively. LIS represents these with Person. For the case of binding, it is proposed that a single User class is used to represent both teachers and students, and that a role element be used to distinguish a user's natural role. In the rest binding to follow, it is possible to select teachers and students within a school, course or class. In LIS, users have an "institution role" set within the person record to identify their (primary) role. Note that this requirement is expanded to introduce other types of human: parents, guardians, relatives and aides. Humans may have relationships with other humans. For example, a student may have parents. The "agents" attribute allows for relationships between humans to be expressed. Note that these are typically from the point of view of the student - so a student will link to its parents (via the agent attribute). The reverse view MUST also be modeled, so for example, a user of role "parent" MUST have agents that are of type "student". Note: Teachers MUST NOT be set as agents of students - the teaching relationship is covered via enrollments. 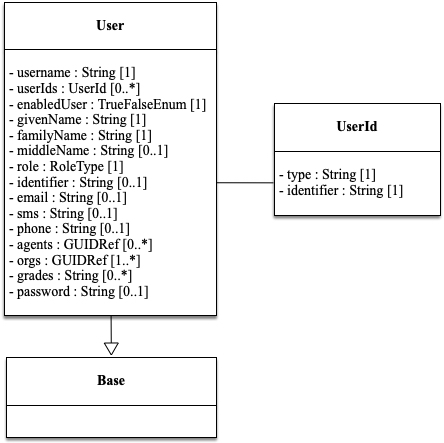 Figure 4.13 - User Data Model. This is the set of external user identifiers that should be used for this user, if for some reason the sourcedId cannot be used. This might be an active directory id, an LTI id, or some other machine-readable identifier that is used for this person. 'false' denotes that the record is active but system access is curtailed according to the local administration rules. This field is used to determine whether or not the record is active in the local system. NOTE: This field was added as part of the rationalization of the 'status' field and the removal of the enumerated value of 'inactive'. If more than one middle name is needed separate using a space "Wingarde Granville"
Links to orgs. In most cases, this is a single link to a school, but could be to a district or national org. People might also be linked to multiple organizations. Grade(s) for which a user with role 'student' is enrolled. The permitted vocabulary is from CEDS (Version 5): https://ceds.ed.gov/ and the 'Entry Grade Level' element https://ceds.ed.gov/CEDSElementDetails.aspx?TermId=7100. The set of permitted tokens for the type of class are listed below. The homeroom (form) assigned to the class. The class as assigned in the timetable. The set of permitted tokens for the type of gender are listed below. The set of permitted tokens for the importance are listed below. A resource of primary usage. A resource of secondary usage/significance. The set of permitted tokens for the type of organization are listed below. Denotes a department. A department may be a subset in a school or a set of schools. Added in V1.1. Denotes a school. This is the unit of assignment for classes and enrollments. Denotes a school district. Added in V1.1. V1.0 instances will use this value to identify districts. Denotes a state level organization. Denotes a national level organization. The explicit hierarchy is: national -> state -> local -> district -> school. Note that a 'department' may be inserted below any entity other than national and above any entity other than national and state i.e. national -> state-> department -> local -> department -> district -> department -> school -> department. The set of permitted tokens for the type of role are listed below. Administrator in the organization (e.g. School). May be used for enrollment. Someone who provides appropriate aide to the user but NOT also one of the other roles. Guardian of the user and NOT the Mother or Father. May also be a Relative. Mother or father of the user. Exam proctor. Added in V1.1. A relative of the user and NOT the Mother or Father. May also be the Guardian. A student at a organization (e.g. School). A Teacher at organization (e.g. School). The set of permitted tokens for the type of score status are listed below. The result is exempt i.e. this score does NOT contribute to any summative assessment. The result is fully graded. The result is not submitted. The result is partially graded. Further scoring will be undertaken and this score must NOT be used in summative assessment i.e. it must become 'fully graded'. The result is submitted. This is a FINAL score and can only be changed as part of a formal review process. The standard workflow is based upon the cycle of: not submitted -> submitted -> partially graded -> fully graded. The set of permitted tokens for the type of academic session are listed below. Denotes a period over which some grade/result is to be awarded. Denotes a semester period. Typically there a two semesters per schoolYear. Denotes a term period. Typically there a three terms per schoolYear. The set of permitted tokens for the type of status are listed below. Denotes that it is safe to delete the record. DEPRECATED. To be mapped to 'tobedeleted. This is a globally unique identifier: it may or may not take the form of a Universal Unique Identifier (UUID). It is a derived from the 'String' base type. Best practice is that the value is globally unique using an appropriate naming/numbering system. Note that the value of a GUID should be treated as case-sensitive. This is a reference to a globally unique identifier. The structure is defined in Figure 4.14/Table 4.13. 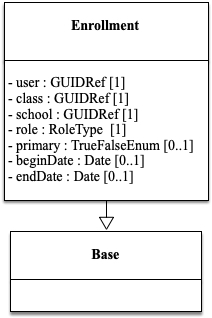 Figure 4.14 - GUIDRef Data Model. 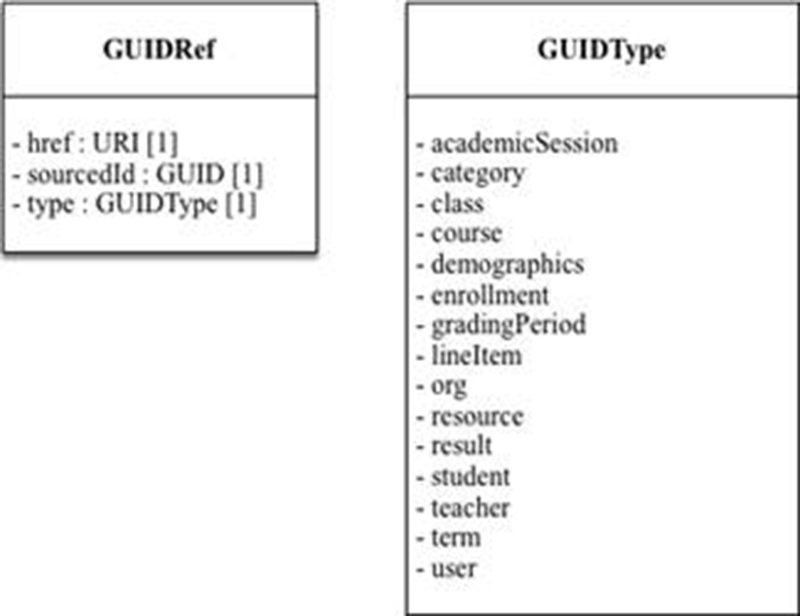 Table 4.13 - Data Elements for GUIDRef. The URI for the type of object being referenced. The globally unique identifier of the object being referenced. The type of object being referenced. This is enumerated. The set of base data-types are defined in Table 4.14. Table 4.14 - The set of base data-types. The boolean data-type with permitted values of "true" and "false". Denotes a date format. Dates MUST be expressed using ISO 8601 format (http://tools.ietf.org/html/rfc3339), more commonly formatted as "YYYY-MM-DD" e.g. "2002-04-23"
Denotes a timestamp format. DateTimes MUST be expressed in W3C profile of ISO 8601 and MUST contain the UTC timezone e.g. "2012-04-23T18:25:43.511Z"
Denotes a date format of year only. Years MUST be expressed using ISO 8601 format (http://tools.ietf.org/html/rfc3339), more commonly formatted as "YYYY" e.g. "2002"
Denotes a sequence of characters that should follow the description. Unless otherwise constrained, a system must be capable of handling strings that are at least 256 characters long. Denotes a URI string format. 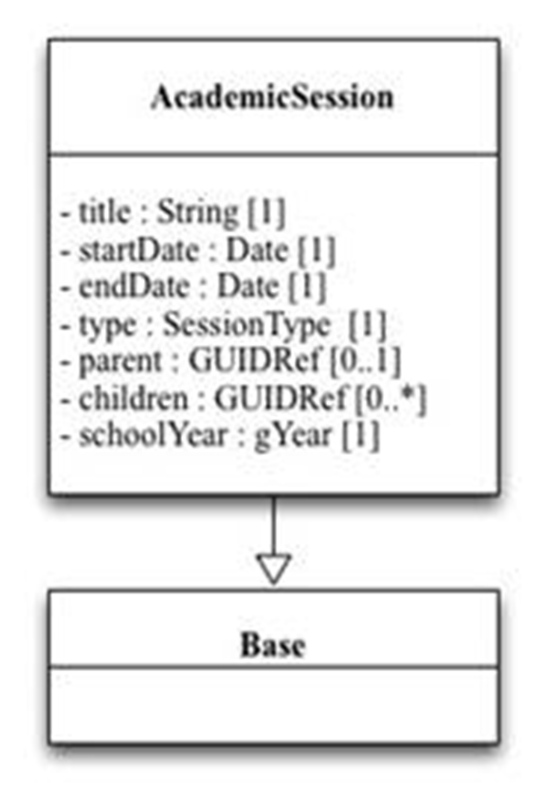 The JSON data structure for the academic sessions data model is shown in Code 5.1. Code 5.1 - JSON binding of the AcademicSessions data model. "sourcedId" : "<sourcedid of this academicSession (term)>"
"status" : "active | tobedeleted"
"dateLastModified" : "<date this object was last modified>"
"title" : "<name of the academicSession (term)>"
"startDate" : "<academicSession (term) start date>"
"endDate" : "<academicSession (term) end date>"
"href" : "<href of the parent for this academic session>"
"sourcedId" : "<sourcedId of the parent for this session>"
"href" : "<href of 1st child for this academic session>"
"sourcedId" : "<sourcedId of the 1st child for this session>"
c) The addition of the new 'schoolYear' value in line 0021. NOTE: In the case of properties that could be a collection e.g. 'children', then a JSON array must always be used i.e. even when there is only a single instance. This rule must be applied to all of the JSON encoding for all objects. The JSON representation of a Grading Period has the same structure and carries the relationship to the term. Code 5.2 - JSON binding of the Grading Period data model. "title" : "<name of the academicSession (grading period)>"
"startDate" : "<academicSession (grading period) start date>"
"endDate" : "<academicSession (grading period) end date>"
b) The addition of the new 'schoolYear' value in line 0014. 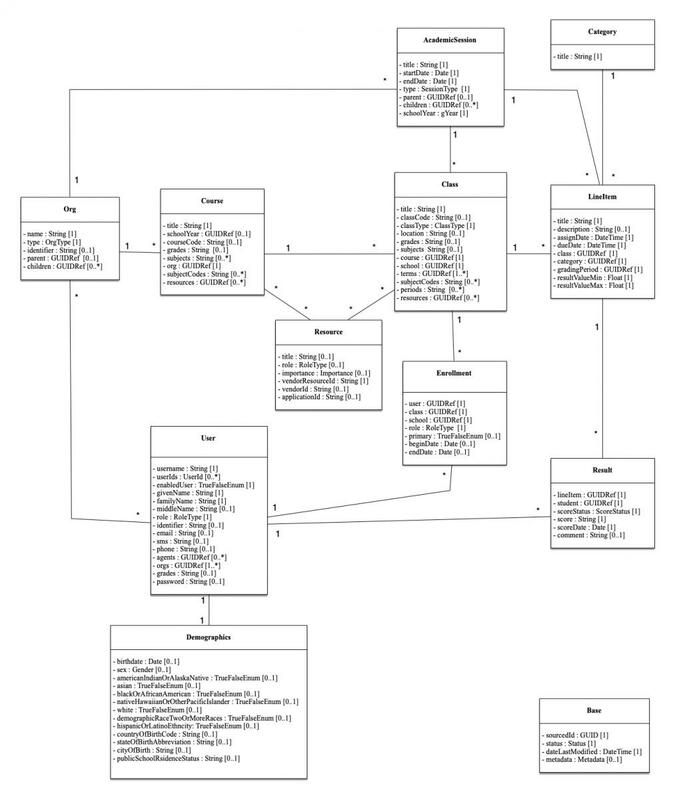 The extended JSON data structure for the class data model in v1.1 is shown in Code 5.3. Code 5.3 - JSON binding of the extended Class data model. "sourcedId": "<sourcedId of this class >"
"dateLastModified" : "<date this class was last modified>"
"title" : "<name of this class>"
"classCode" : "<human readable code for this class>"
"classType" : "homeroom | scheduled"
"href": "<href of the course that this is a class of>"
"sourcedId": "<sourcedId of the course that this is a class of>"
"href": "<href of the school that this is a class of>"
"sourcedId": "<sourcedId of the school that this is a class of>"
"href": "<href of the first term that this class is in>"
"sourcedId": "<sourcedId of the 1st term that this class is in>"
"href" : "<href of the resource related to this class>"
"sourcedId" : "<sourcedId of the 1st resource>"
"sourcedId" : "<sourcedId of the nth resource>"
c) The set of resources are identified using lines [0030-0041]. The JSON data structure for the original (v1.0) data model is shown in Code 5.4. Code 5.4 - JSON binding of the Course data model. "sourcedId": "<sourcedId of the course>"
"duration" : "<how long this course takes to teach>"
"title" : "<title of the course>"
"href": "<href of the academicSession (school year) related to this course>"
"sourcedId": "<sourcedId of the academicSession (school year) related to this course>"
"courseCode" : "<course code for the course>"
"href": "<href of the org related to this course>"
"sourcedId": "<sourcedId of the org related to this course>"
b) The organization associated with this course is identified in lines [0019-0023]. The JSON data structure for the extended (v1.1) data model to include reference to the associated course resources is shown in Code 5.5. Code 5.5 - JSON binding of the new Course data model. "href" : "<href of the resource related to this course>"
b) The set of resources are identified using lines [0025-0036]. The JSON data structure for the demographics data model is shown in Code 5.6. 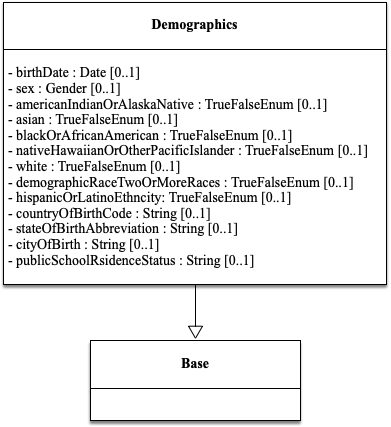 Code 5.6 - JSON binding of the Demographics data model. "sourcedId" : "<sourcedid of this demographics record (same as user referenced)>"
"dateLastModified" : "<date these demographics were last modified>"
The abstract data model requires the sourcedIds of the user, school and class for the enrolment. In the JSON these need to be specified as links. This means a full 'href' as well as a 'sourcedId', as shown in Code 5.7. Code 5.7 - JSON binding of the Enrollment data model. "sourcedId" : "<sourced id of this enrollment>"
"status" : "<status of this enrollment>"
"dateLastModified": "<date this enrollment was last modified>"
"role" : "teacher | student | parent | guardian | relative | aide | administrator | proctor"
"href" : "<href of the user for this enrollment>"
"sourcedId" : "<sourcedId of the user for this enrollment>"
"href" : "<href of the class for this enrollment>"
"sourcedId" : "<sourcedId of the class for this enrollment>"
"href" : "<href of the school for this enrollment>"
"sourcedId" : "<sourcedId of the school for this enrollment>"
d) The new 'beginDate' and 'endDate' structures are shown in lines [0023-0024]. The JSON data structure for the line item data model is shown in Code 5.8. Code 5.8 - JSON binding of the LineItem data model. "sourcedId" : "<sourcedId of this lineItem>"
"title" : "<title of this lineItem>"
"description" : "<description of this lineItem>"
"assignDate" : "<date that this lineItem was assigned>"
"dueDate" : "<date that this lineItem is due>"
"href" : "<href to this category>"
"sourcedId" : "<sourcedId of this category>"
"href" : "<href to the class this line item is for>"
"sourcedId" : "<sourcedId of the class this line item is for>"
"href" : "<href to this grading period>"
"sourcedId" : "<sourcedid of this grading period>"
"resultValueMin" : "<floating point value of the minimum score>"
"resultValueMax": "<floating point value for the maximum score>"
d) The constraints for an associated results and defined in lines [0024-0025]. The JSON data structure for the line item categories data model is shown in Code 5.9. Code 5.9 - JSON binding of the LineItem Categories data model. "title" : "<title of this category>"
The JSON data structure for the Org model is shown in Code 5.10. Code 5.10 - JSON binding of the Org data model. "sourcedId" : "<sourcedId of this org>"
"dateLastModified" : "<date this ORG was last modified>"
"name" : "<name of the org>"
"type" : "school | local | state | national"
"identifier" : "<human readable identifier for this organization>"
"href" : "<href to the parent org>"
"sourcedId" : "<sourcedId of the parent org>"
"href" : "<href of the first child org>"
"sourcedId" : "<sourcedId of the first child org>"
"href" : "<href of the n'th child org>"
"sourcedId" : "<sourcedId of the n'th child org>"
b) The children organizations are identified using lines [0013-0024]. The JSON representation of an array of schools is shown in Code 5.11. Code 5.11 - JSON binding of the Orgs data model. "sourcedId": "<sourcedid of first school>"
"dateLastModified" : "<date this school was last modified>"
"name" : "<name of first school>"
"sourcedId": "<sourcedid of n'th school>"
"name" : "<name of n'th school>"
c) The parent organization for the last 'org' is identified using lines [0023-0027]. 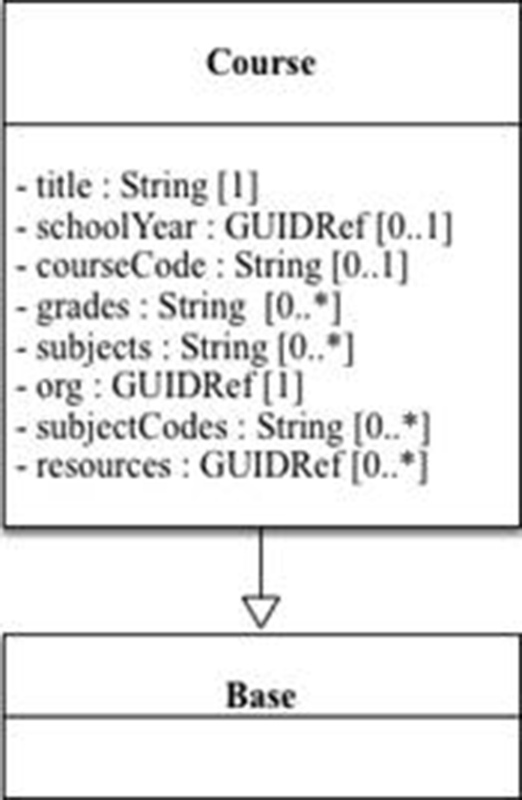 The JSON data structure for the extended (v1.1) data model to include reference to the associated course resources is shown in Code 5.12. Code 5.12 - JSON binding of the new Resource data model. "sourcedId": "<sourcedId of the resource>"
"title": "<title of the resource>"
"vendorResourceId" : "<vendor allocated unique resource ID>"
"vendorId": "<GUID of the vendor who created the resource>"
"applicationId": "<GUID of the application to use the resource>"
a) Each resource MUST have a 'sourcedId' [line 0002] (used for the interoperability exchange) and the unique identifier allocated by the vendor to the resource [line 0007] used to provide identification of the resource within the learning context. The JSON data structure for the result data model is shown in Code 5.13. Code 5.13 - JSON binding of the Result data model. "sourcedId" : "<sourcedid of this grade>"
"dateLastModified" : "<date this result was last modified>"
"href" : "<href to this lineItem>"
"href" : "<href to this student>"
"sourcedId" : "<sourcedId of this student>"
"score" : "<score of this grade>"
"scoreStatus" : "not submitted | submitted | partially graded | fully graded | exempt"
"scoreDate" : "<date that this grade was assigned>"
"comment" : "<a comment to accompany the score>"
a) The actual result, the score, is supplied in Line 0015. The JSON data structure, for v1.0, for the users data model is shown in Code 5.14. A Teacher and Student are an instance of User. Code 5.14 - JSON binding of the User data model. "sourcedId" : "<sourcedid of this user>"
"dateLastModified" : "<date this user was last modified>"
"username" : "<username to use for this user>"
"identifier" : "< assigned value for the identifier>"
"enabledUser" : "true | false"
"givenName" : "<this user's given name>"
"familyName : "<this user's family name>"
"role" : "teacher | student | parent | guardian | relative | aide | administrator"
"identifier" : "<human readable ID, such as student id>"
"email" : "<email address for this user>"
"sms" : "<sms number for this user>"
"phone" : "<phone number for this user>"
"href" : "href of the first agent (e.g. parent) for this user"
"sourcedId" : "sourcedid of the first agent for this user"
"href": "href of the n'th agent for this user"
"sourcedId" : "sourcedid of the n'th agent for this user"
"href": "<href of the 1st org to which this user is attached>"
"sourcedId": "<sourcedId of the 1st org to which this user is attached>"
"href": "<href of the nth org to which this user is attached>"
"sourcedId": "<sourcedId of the nth org to which this user is attached>"
c) The links to the set of organizations are denoted by lines [0027-0039]. The JSON data structure for the extended users data model, v1.1, is shown in Code 5.15. Code 5.15 - JSON binding of the extended User data model. "type" : "<Type of identifier>"
"identifier" : "<active directory/lti user id/some other id >"
"middleName : "name1 name2 name3"
"password" : "<Password for the user>"
c) The new 'grades' and 'password' structures are shown in lines [0045-0046]. It is possible to request the return of a collection of objects available e.g. all users, all schools, all courses, etc. 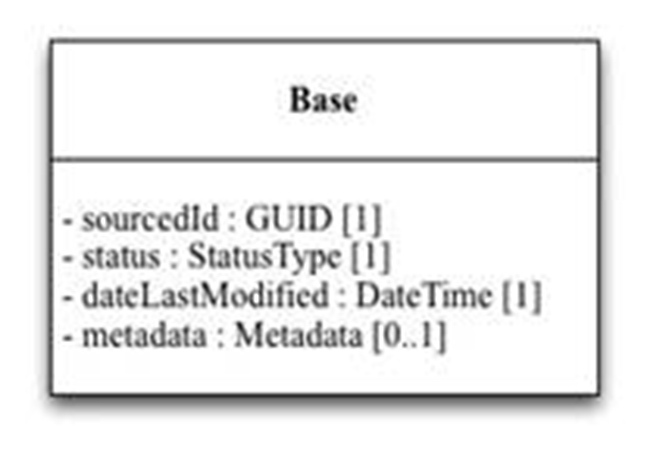 The outline JSON returned for each of the single and collection calls is shown in Table 5.1. If the returned response could be a collection then the equivalent returned JSON must use an array with a single entry. Table 5.1 JSON structure for returning a single objects and collection of objects. This is also used for 'gradingPeriod' and 'term' payloads. This is also used for 'gradingPeriods' and 'terms' payloads. This is also used for 'school' payloads. This is also used for 'schools' payloads. This is also used for 'student' and 'teacher' payloads. This is also used for 'students' and 'teachers' payloads. In Code 5.16 is an example in JSON (showing an ncesId for a fictitious private female only boarding school that is also an IMS associate member). Code 5.16 - JSON binding of the Metadata data model. "sourcedId" : "<sourcedId of this object>"
a) The actual metadata is listed in lines [0005-0009]. In Code 5.17 is an example of the transaction status code payload that MUST be returned in the case of a failure to service the request. This payload may also be appended to a partially successfully completed request. Code 5.17 - Transaction-level error code payload. "imsx_codeMajor" : "success | failure | unsupported"
"imsx_severity" : "status | warning | error"
"imsx_messageRefIdentifier" : "<request message ID reference>"
"imsx_operationRefIdentifier" : "<request operation ID reference>"
"imsx_description" : "<human readable description>"
"imsx_codeMinor" : "<from the set of permitted values>"
g) If it is important to return some indication of the operation being requested the some ID can be returned as shown in line 0006 (for example the name of the endpoint e.g. getUser, getResources, etc.). IMS recommends that the following vocabularies and terms be used in the data model. The permitted vocabulary is from CEDS (Version 5) and the 'Entry Grade Level' element: https://ceds.ed.gov/CEDSElementDetails.aspx?TermId=7100. The permitted vocabulary is from SCED (School Codes for the Exchange of Data) (Version 4): http://nces.ed.gov/forum/SCED.asp. The complete data model is shown in Figure B1. Figure B1 - The complete data model for OneRoster. Summary: This document outlines a vision for a K12 focused Learning Information Services, built upon 'technical simplicity'. The OneRoster core specification uses a RESTful binding using JSON data structures to achieve technical interoperability. Purpose: This document is made available for public adoption. Final Release of the OneRoster Specification. New optional security features have been added. A number of editorial corrections ONLY. In Section 3.4.3 the examples explaining the filtering rules for equals and contains have been corrected. IMS Global Learning Consortium, Inc. ("IMS Global") is publishing the information contained in this IMS OneRoster Specification ("Specification") for purposes of scientific, experimental, and scholarly collaboration only. The format of the GUID is an implementation specific decision i.e. it is NOT restricted to the 128-bit form of a Universal Unique Identifier (UUID). NOTE: In order to make all examples look clearer, commas have been omitted from the end of lines.